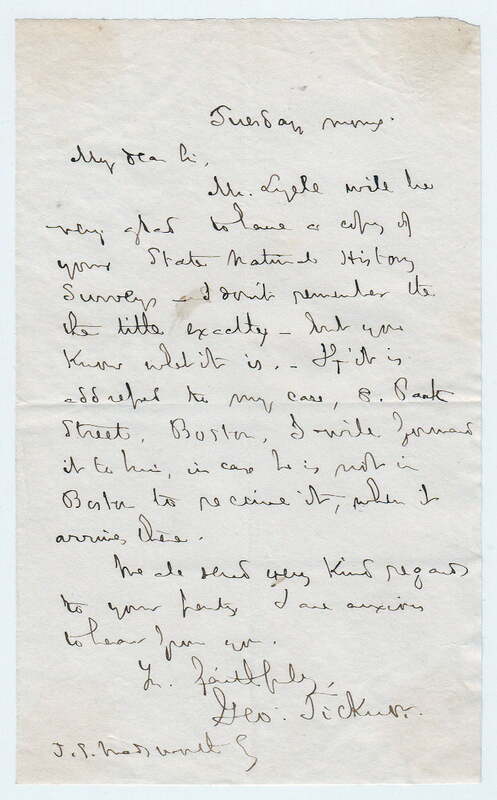 Autograph Letter Signed, to James S.Wadsworth, informing him that Mr. Lyell will be glad to have a copy of “your State Natural History Surveys”, asking him to send the book to 8 Park Street, Boston. 1 page 7 x 4 inches, fine. Tuesday morning, undated. “I don’t remember the title exactly, but you know what it is.” George Ticknor (1791 – 1871), American academician and Hispanist, specializing in the subject areas of languages and literature. He is known for his scholarly work on the history and criticism of Spanish literature.